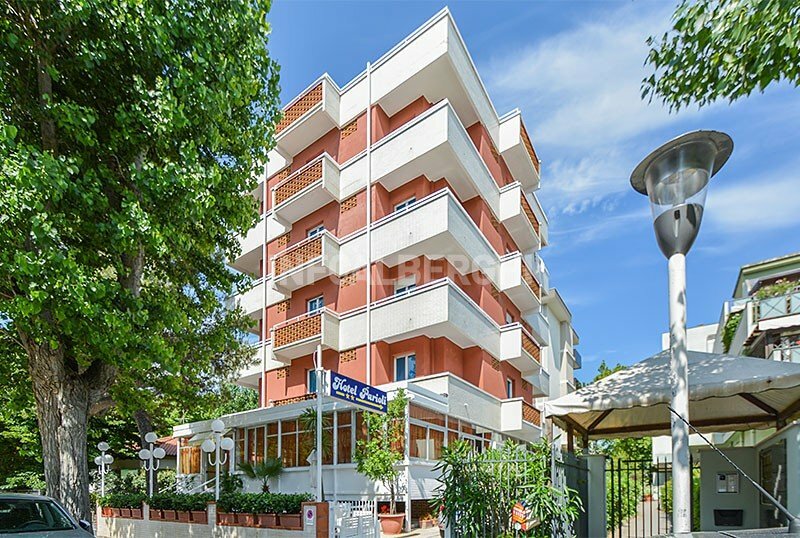 Hotel Parioli is a 2-star hotel just a few steps from the sea and close to the Riccione spa. Family-run for 4 generations, it offers a sun terrace, WI-FI connection and allows you to take your 4-legged friends on holiday. The hotel is located in a quiet and peaceful area, near the beach and the Riccione spa. A short walk from the hotel is a fun fair, while a 10-minute walk takes you to Via San Martino, a pedestrian area from where you can take a train that leads to Viale Ceccarini. The hotel rooms have a balcony (some with sea view), ceiling fan, WI-FI, telephone, digital terrestrial TV and private bathroom with open shower and hairdryer. On request: air conditioning and minibar. FAMILIARIES: solutions with multiple beds are available for families. Garden, free use of bicycles, panoramic sun terrace, lift, TV lounge, bar and luggage storage. PARKING: uncovered and free parking spaces, available while seats last. LUNCH AND DINNER: the kitchen offers 3 menus to choose from with typical recipes of Romagna, fish specialties, meat, vegetables, pasta dishes and homemade desserts. The menu is accompanied by rich buffets of cooked, raw vegetables, desserts and diet dishes. VARIATIONS: vegetarian dishes are available. In hotel: strollers available and pediatric consultation on request. At meals: dedicated menus on request, high chairs at the table. The hotel has an agreement with the Bagno n. 38, equipped bathing establishment with children's playground area, sports fields and services. The prices of the price list (full board), are per person per day for a min. 3 days. TOURIST TAX: € 0.70 per day per person (first 7 days only). Children 0-13 years: exempt. ALL INCLUSIVE: Full board + Water and 1/4 of wine with meals + Beach service (umbrella, cot and cabin at the partner beach).